Welcome to the two hundred and sixtieth of my blog interviews with novelists, poets, short story authors, biographers, agents, publishers and more. Today’s is with author, screenwriter, journalist and radio presenter Ellen Dean. A list of interviewees (blogged and scheduled) can be found here. If you like what you read, please do go and investigate further. Ellen: Before I started to write I was an entrepreneur. I managed two businesses I built from scratch. I sold them both and started to write feature articles for national magazines. I’ve always had a vivid imagination and still have some old school books with stories I wrote in school. Sometimes I wonder if I should expand on them and build a novel. It’s an interesting prospect! I am originally from County Durham but live in North Yorkshire now. Recently I tried my hand at writing screenplays. My first screenplay is to be filmed early 2012 by HEM Productions. I love music and present a weekly radio show on Durham Dales Radio. Morgen: My goodness, what a wonderful variety. What genre do you generally write and have you considered other genres? Ellen: My first novel, Beautiful Strangers, is lesbian / crime genre. I am currently co-writing a non-fiction personal inspiration book entitled ‘Live Your Dream’. Morgen: I am… or I will be hopefully soon – leaving my day job to be a bread and water writer. 🙂 What have you had published to-date? Ellen: One novel published to-date entitled Beautiful Strangers, and I have a new short fiction ebook coming out in the next few days. It’s called ‘A Musical Jaunt with Sam and Diana’ and will be available on Kindle and Smashwords. And two non-fiction books published this month: ‘2006/2007 Blog Diary Volume One’ and ‘Famous Quotes By Famous People, From Socrates to Nicole Kidman, Be Inspired!’ Both are currently available on Kindle. Morgen: I’ve just bought a Kindle… it’s great. 🙂 Out of everything you’ve written, do you have a favourite of your stories or characters? Ellen: My favourite character is Dr. Hyacinth Dickinson: she has many sides to her personality, some nice and some not so nice. Morgen: I love the sound of her. If applicable, can you remember where you first saw one of your books in a bookshop or being read by a member of the public?? Ellen: I first saw my book on the shelves in Waterstones bookstore in Manchester. I first saw my book being read by a member of the public in a hotel in London. Morgen: Wow. I wonder if they interpreted / read it how you planned it. Are your books available as eBooks? If so what was your experience of that process? Do you have any plan to write any eBook-only stories? And do you read eBooks? Ellen: All of my books are available on eBook. I converted them myself. Beautiful Strangers is available on Kindle and Smashwords. I found doing this quite challenging at first but once you get your head around the formats the rest is easy. Morgen: I wouldn’t dare. 🙂 Actually, that makes two of us as although my Kindle is only a week old, I prefer pBooks (as they’re now referred as). How much of the marketing do you do? Ellen: I do all my own marketing. I am on every social networking site imaginable. It’s a full time job in itself. But, I tend to market other people 80% and myself 20%. Apart from Facebook and Twitter, I make short videos for Youtube, and write blogs. Morgen: I must look at creating some videos – they do look like fun. Do you write under a pseudonym? Do you think they make a difference to an author’s profile? Ellen: Yes, I do write under a pseudonym. Not sure whether it makes a difference. I chose Ellen Dean because I played the housekeeper Ellen Dean in the stage production of Wuthering Heights. Ellen: I’m working on the sequel to Beautiful Strangers called Beyond Midnight, and am co-authoring a non-fiction Mind, Body and Spirit book entitled Live Your Dream (this will have a sub-title too but that is still in the melting pot). Plus, I have another screenplay on the go. Morgen: A nice variety so you may not suffer from writer’s block? Ellen: If I feel I have a block I work on something totally different and it seems to do the trick. I then go back to whatever it was I was stuck with. Ellen: Initially I get the idea and run with it. Once I’ve jotted down the idea, then I work on the plot. Ellen: I write in longhand and when the manuscript is typed into my computer I class it as the first edit. I hope my writing is becoming more fully formed now. Morgen: It’s really just about practice, isn’t it, like playing the piano or painting. Do you have to do much research? Ellen: I do quite a lot of research. The internet comes in very handy. Morgen: Doesn’t it. I love being an author now. Some writers like quiet, others the noise of a coffee shop etc., do you listen to music or have noise around you when you write or do you need silence? Ellen: I usually like to listen to music while I write or even have the TV on in the background. I don’t watch the TV: it’s there in the background. Morgen: Me neither – I just end up staring at it. What point of view do you find most to your liking: first person or third person? Ellen: I have only written in the third person. Ellen: I don’t think so. Once I start something I like to finish it. Morgen: Oh, well done. I have loads. Well, loads of old writing I need to revisit to see whether I can do something with. What advice would you give aspiring writers? Ellen: I would say to believe in yourself. If you decide to use a self-publishing company to publish, make sure you have your work edited. If other authors give you advice, take it. I was given really good advice from Kelly Smith of Bywater Books and I took it. Morgen: 🙂 We mentioned Kindles earlier, what do you like to read? Ellen: I read both fiction and non-fiction. I enjoy a good thriller, filled with suspense, but I don’t like lots of blood and gore as there’s already too much of that in world without reading about it as well. I’m reading Falling Star by Diana Dempsey at the moment and I’m loving it. Morgen: If you could invite three people from any era to dinner, who would you choose and what would you cook? Ellen: The Queen, Rosemary Shrager (celebrity chef) and John Locke (author). It would be safer for Rosemary to cook because I don’t interfere with cookers – they get very hot! Although Rosemary Shrager did teach me how to cook porridge properly. Morgen: I’d definitely go with John Locke and ask him how he sold a million eBooks (although I could just buy his ‘how to’ book, although that wouldn’t be as much fun). Is there a word, phrase or quote you like? Ellen: I write for The Life of Luxury in the UK/Europe and Shewired in Los Angeles. I also write occasional articles for regional newspapers. Ellen: I love to walk, and love to play Wii Tennis. I also love to dance. I’m a member of Masham Amateur Dramatic Society and in 2010 directed my first play called Ding Dong. I enjoyed it so much I am trying to find the time to direct another one. Morgen: How lovely. I love the theatre. Are there any writing-related websites and/or books that you find useful? Ellen: There are so many websites and books relating to writing and sometimes with conflicting advice. But, I do use Goodreads http://www.goodreads.com The Blood Red Pencil www.bloodredpencil.blogspot.com and Shewrites www.shewrites.com. Morgen: I’m on Goodreads and often get friend requests but haven’t explored it much. I’d heard good things about it via LinkedIn but only joined when a Google Alert told me that Goodreads had picked up on one of my eBooks (and I must work out how to get the rest added). I have reviewed zero books which looks like I’m very badly read but I do plan on adding some at some stage. 🙂 I mentioned LinkedIn, are you on any forums or networking sites? If so, how valuable do you find them? Ellen: Shewrites, Goodreads, Facebook, Twitter, Youtube. I find them extremely valuable. Ellen: I think the future is the same for everyone, whether you’re a writer or a Saggar Makers Bottom Knocker! You make your own future but you have to decide to take charge and make it happen. You only get out of anything, what you put in. Morgen: Absolutely. No-one will know your books exist if you don’t get out there (without touting like mad and getting people fed up with you). Where can we find out about you and your work? Ellen: My website www.ellendean.co.uk there are links to many places where you can buy my books, and a couple of fun videos, news and events. Morgen: Brilliant, thank you Ellen. Update September 2012: The non-fiction personal development / inspiration ebook co-written with Olivia Tarn called (sub-title) ‘How to identify your personal starting point and Live Your Dream One Step At A Time’ was published February 2012. 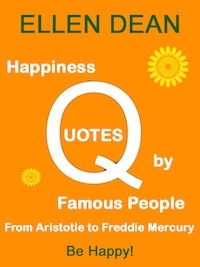 Another non-fiction ebook ‘Happiness Quotes by Famous People from Aristotle to Freddie Mercury. Be happy!’ published April 2012. 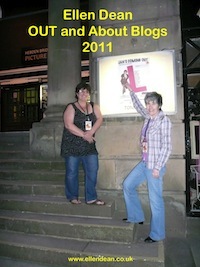 The fun short fiction ebook Sam and Diana’s Musical Jaunt published 1st March 2012 World Books Day. This is now available on audio podcast through Youtube.com/ellendean and Soundcloud. My niece Amy Addison added some fun sound effects. The above 3 ebooks are available on Kindle and in all formats on Smashwords. I have 4 more blog ebook diaries available on Kindle: Ellen Dean – OUT and About 2008 Blog, Ellen Dean – OUT and About 2009 Blog, Ellen Dean – OUT and About 2010 Blog, Ellen Dean – OUT and About 2011 Blog. The screenplay ‘The Icing On The Cake’ is going down a different route – check out for updates on my website. The sequel to Beautiful Strangers titled ‘Beyond Midnight’ is shaping up nicely but as yet don’t have a publishing date.